The present work is concerned with three placement concepts. George Sands devised one in the mid-Twentieth Century. 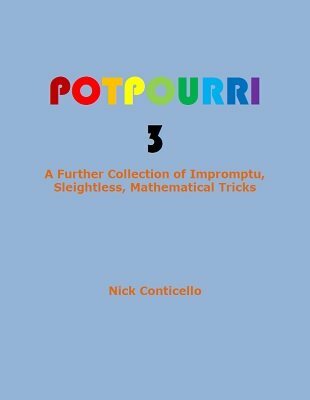 Nick published the second in Tarbell 7 , and he is releasing a totally new idea in this ebook. All but one of the effects is hands-off, meaning they can be performed face-to-face or by any means of telecommunication. The Magic Word: A thought-of card is revealed by spelling a magic word. Shifting Sands: A variation of the above. Personal Prediction: using the spectator's name. The Red and the Black: Two cards located in the order the spectator chooses. Self Promotion 2: The performer divines the position of a chosen card in a packet of unknown size. Plus two gag effects for magicians. Election Process: The volunteer chooses the name of any president, where the chosen card is placed, how many cards to use and how to mix the packet, but the performer still knows where the card is. Telespell Routine: Three location effects using ten or fewer cards. An Australian Reverie: A Mindreader's Dream with a small packet containing an unknown number of cards. AN ETHICAL DILEMMA: Brief essay on the nature of effects like those in this ebook.